I am staying with a dear friend, JP, in Edison. I like the weather today. Overcast, windy and occasional rain. The northern California weather of always sunshine gets a bit tiring at times. Last night after dinner at DC (just a stone’s throw away from the White House at the world famous Willard Intercontinental Hotel — I must mention), I hit the road. I took I-495/95 for the first bit, passing Baltimore, MD. Then crossed the Delware Memorial Bridge. . The bridges provide an important regional connection for long-distance travelers. 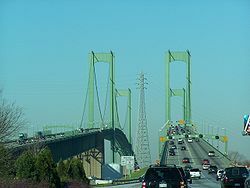 While not a part of Interstate 95, they connect two parts of the highway: the Delaware Turnpike (Interstate 95 in Delaware) on the south side with the New Jersey Turnpike (later Interstate 95 in New Jersey) on the north side. . . The bridges are dedicated to those from both New Jersey and Delaware who died in World War II, the Korean War and the Vietnam War. On the Delaware side of the bridge is a War Memorial, visible from the northbound side lanes. The toll facility is operated by the Delaware River and Bay Authority. I exited NJ Turnpike at exit 9 after about 80 miles on it. Road tolls drive me crazy. On the West coast, we don’t have them; only on bridges. But around here, you have to pay toll to use their roads. Injustice, I say. Highway robbery. There should be a law against this sort of highway robbery. Anyway, c’est la vie. Keep tuned for further updates on where in the world I am. Have fun. Aha! By the way – I study at Rutgers and live in New Brunswick. Is the comment on highways meant to be sarcastic? Surely you as an economist would know – providing goods for free causes inefficiency in the market because more of the good is demanded than if users were to pay the full cost of consumption. The bits about the tolls on East coast roads was tongue in cheek. It was not meant seriously.